Honda Motorcycle & Scooter India Pvt. Ltd. (HMSI), the 100% owned 2-wheeler subsidiary of the Honda Motor Company, Japan – the world’s largest manufacturer of 2-wheelers, today unveiled the new CBF Stunner PGM-FI in New Delhi. The new CBF Stunner PGM-FI is targeted mainly at youngsters in the 18-24 years age-group. Being promoted with the punchline ‘Absolute Sensation Reprogrammed’ CBF Stunner PGM-FI always reminds you of the CBR1000RR image, thus making it more appealing to the youth. The introduction of PGM-FI (Programmed Fuel Injection) technology has made the bike’s performance exceptional on various drivability parameters. The CBF Stunner was launched last year and had attracted the attention of country’s youngsters as an affordable sports bike. The introduction of new variant with advanced PGM-FI technology now will further boost the popularity and performance of the model. 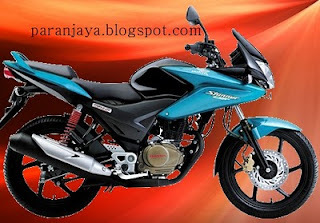 Powered with a 125 cc Air-cooled four-stroke self-start engine, the new model will deliver a power of 11.6 bhp@8000 rpm. The PGM-FI technology has greatly contributed towards increasing the efficiency, top speed and engine power. The new model will give a mileage of 65 kms per litre as compared to 60 kms per litre delivered by the earlier Stunner. Even the top speed of 100 KM/Hr can be enjoyed by biking enthusiasts. Another strong point of CBF Stunner PGM-FI is the manner in which it addresses the environmental issue. Though all the Honda products adhere strictly to the emission norms, the PGM-FI technology in CBF Stunner PGM-FI has enabled to bring down the emission levels to one-tenth of the existing emission norms in India. The New CBF Stunner PGM-FI requires less maintenance because of its viscous air filter and maintenance-free battery. It has CBR1000RR inspired dual tone styling and a sporty half-chain case. Among the other attractive feature of CBF Stunner PGM-FI include: Bank Angle Sensor, Premium 3-D Emblem, Handle Weight and the premium key. The CBF Stunner PGM-FI will hit the roads by first week of June. It will be available in two stylish colours – CBR Red and CBR Silver Metallic. The bike has been priced at Rs 64,630 ex-showroom. Honda is looking forward to expanding the fun biking culture among the youngsters with the launch of CBF Stunner PGM-FI. The company has already entered the fun-biking segment with the introduction of CB1000R and CBR 1000RR Fireblade in the Indian market. The bikes have drawn a good response from the biking enthusiasts. In order to promote and expand fun-biking culture, HMSI has been conducting the ‘Honda 1 Make Race’ motor sports event since last year. The company is in full gear preparing for this motorsports event which is scheduled from the first week of June this year in Coimbatore. Present at the CBF Stunner PGM-FI launch event were: Mr Atsushi Amataka, President, Honda R&D India; Mr Shinji Aoyama, CEO & President, HMSI; along with Mr N.K. Rattan, Operating Head – Sales & Marketing, HMSI. HMSI is one of the youngest players in the industry and currently the fastest growing company in Indian 2w industry. The company grew at the rate of 18% in 2008-09 & sold 10.7 lac units. The company has set a target to achieve 12.5 lakh sales mark in this financial year 2009-10. I don't like this bike model. IT's so heavey.